Today we climbed another mountain to Temple 65, Sankakuji, the triangle, or three corners temple. The weather today was perfect for hiking, cloudy but not rainy. The clouds made the day less hot and provided nice sun filtration. Temple 65, Sankakuji, is located on one of the lower peaks of Hirashiyama mountain. To get there, we walked along busy urban stretches full of smoky factories into a rural area of rice fields and quiet neighborhoods. But even though the temple was not located as steeply as the mountain peak that we had climbed the day before, still the climb felt very strenuous. I stopped often to catch my breath and appreciate the forest. Below us, the city looked full of factory smoke stacks which were belching white smoke so thick, that it looked like the city was on fire. The photos we took of the city, just smeared the horizon into a white blur. The temple at the top felt like a real mountain temple. Secluded, beautiful, with ancient trees and wood carvings of dragons on the beams. We took the time to pray and enjoy the temple, before our long walk down to the city and to our modest hotel for the night, the LiveMax business hotel. When we reached the outskirts of the city, we spotted an Aeon Mall. Aeon malls are located everywhere in Japan. This one had a supermarket with a good health-food section. We loaded ourselves up with cashews, raisins, dates, golden berries, dried mangos and dried bananas. Now we had enough snacks for our long days of forest hiking, when we rarely come upon places to eat. Our hotel is a typical business hotel, with absolutely no frills. They had no Wifi internet, but they did have a coin operated washer and dryer. Our room was small, but with clean sheets and clean white pajamas to sleep in. At least we had our own toilet and a shower with good hot water and water pressure right in the room. By the time we arrived at our hotel, it was pouring rain so hard, that we decided to skip going out again to dinner. Instead we ate some of the nuts and dried fruit that we’d just bought. Sitting in our tiny room with the twin beds pushed to each side of the walls, we talked about the fact that it looks like we might complete the pilgrimage sooner than we’d first thought. Jules adds: “Sankakuji is the final temple in Ehime Prefecture. Tomorrow, we will enter the Dojo of Nirvana, the fourth and final prefecture of Shikoku, Kagawa. 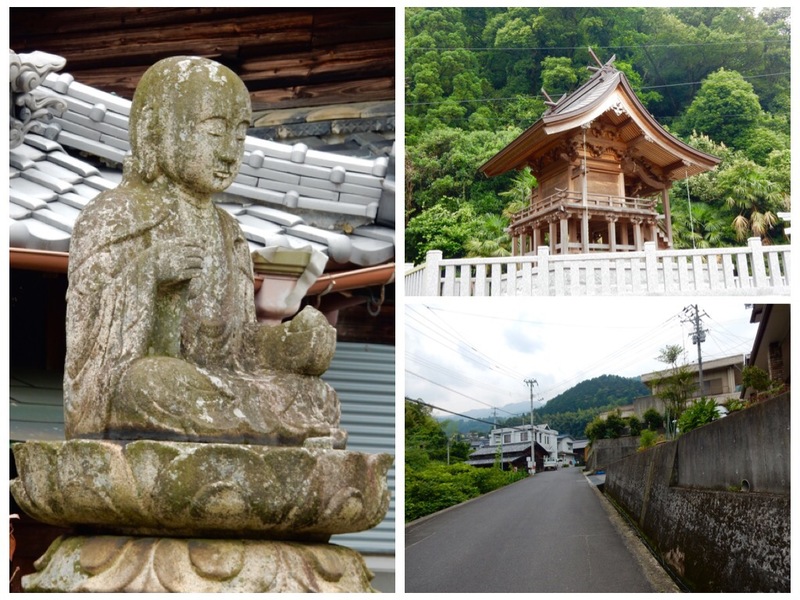 Most of the temples in Kagawa are pretty close together, so the time required to visit its 23 temples will be less than in Kochi prefecture, where there are long, multi-day walks between temples. The fact that these final temples of the pilgrimage require less time than we are used to, has led us to start to think (rather than just dream) of the pilgrimage ending, and how we will spend our final two weeks of this trip. With the plans that we have made, walking about 20- 27 kilometers every day, we are likely to be in Takamatsu in about a week. That means that we will complete the pilgrimage about two weeks before we leave Japan to go home. How shall we spend them? Should we go diving and snorkeling somewhere? We have already been to the tropical part of Japan in Okinawa and the Southern Islands of Japan…. Should we change our flight and go home to Colorado early, thus gaining a few weeks home before our trip to India? I also have four paintings to pack and to ship to my collectors, who have contacted me during the pilgrimage and bought my paintings…. But we’ve already planned to stop in Los Angeles and to stay with my sister, and my mother who is also flying to meet us there…..
Jules suggested that we could still fly home early and then fly from Colorado to Los Angeles to meet my mother and be with my sister as scheduled, and to use the return ticket we’ve already booked, to return from LA…. We started to talk about the possibility of flying to the Philippines, where the diving and snorkeling is fabulous, the food is good and it isn’t very expensive, nor does it take that long to get there from Japan…..
We could spend two weeks diving and beaching it in the Philippines, and then return to Japan and fly to LA as scheduled. Sitting on our single beds in our tiny room in the city of Mishima, just east of Nihama and talking about diving in the Philippines after our pilgrimage is over, felt like we were two dreamers…. Will we EVER make it to the end?…..
Will we ever stop walking?….. The temple was founded by Gyōgi in the year 815. Kōbō Daishi did not dive in the Philippines, but he did perform a 21 day Goma of Victory ritual here and carved the main deity honzon. The triangular Goma altar which Kōbō Daishi used in that ceremony, is what gave the temple its name, the triangle temple. Emperor Saga (786 – August 24, 842) the 52nd emperor of Japan, gave the temple 750 acres of land and it prospered until the 16th century. At that time the temple was destroyed by fire and then later restored. The name of the mountain Sangō or Yurei-san means Ghost Mountain. Legends say that a ghost once lived around the temple and caused a lot of trouble. Kōbō Daishi freed the ghost through a Goma ritual, using the triangle altar. This temple is known as a place to come to pray for an easy childbirth but there is a twist. The expectant mother is supposed to pretend to break into the temple and steal a rice ladle, which she then places under her bed. After the delivery, she brings the ladle back to the temple for someone else to take and hide. Because the temple is located on top of the mountain, her efforts to get here to steal the ladle are a sign of her strong determination.